1 of 6 Heat oven to 450 degrees F. Place racks over 2 baking sheets; set aside. 2 of 6 Place flour and egg whites in separate shallow glass dishes. Whisk whites until foamy. 3 of 6 Place panko, Parmesan and Old Bay on a separate glass plate; stir to combine. 4 of 6 Coat zucchini in flour, dip into egg whites, then coat with panko mixture. Place on rack and coat lightly with nonstick cooking spray; set aside. 5 of 6 In a small bowl, whisk mayonnaise, vinegar and hot pepper sauce. Divide in half; set one half aside. 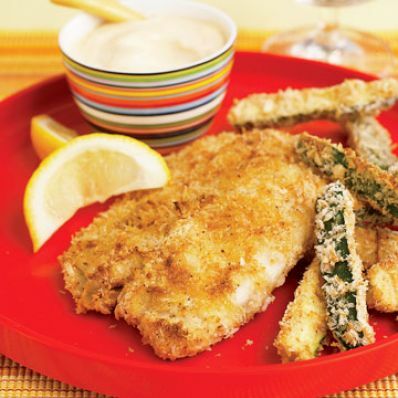 Brush one side of tilapia fillets with mayonnaise mixture and place that side down in flour. Brush top side of fillets with mayonnaise mixture and carefully flip over into flour. Dip in egg whites; coat with panko mixture. Place fillets on second rack. Coat lightly with nonstick cooking spray. 6 of 6 Place zucchini in oven. Bake at 450 degrees F for 3 minutes, then add fish and cook 15 more minutes or until fish flakes easily. Serve with reserved mayonnaise mixture. 1 of 1 Buy these Japanese-style bread crumbs in the Asian-ingredient section of your market or use regular bread crumbs.